We strive to provide our customers with the highest quality parts for Volkswagen and Audi. Finding the right used Volkswagen parts for your vehicle is incredibly easy. Mechanics, car owners, or dealers can also turn to Russ' for everything from engine replacements to used transmissions, alternators, and more. We’ll help you find the right make and model used parts. Russ' employees are by far our greatest asset and they are what gets you the right part the first time. They are veteran Audi dismantlers with an immense amount of Audi parts information in their heads. Want to see if we have the Audi part you're looking for? Call today! 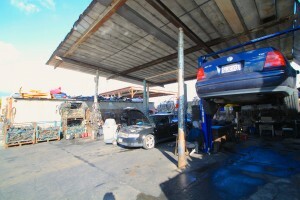 Russ’ Recycling has been in business over 30 years specializing in late model VW and Audi parts. We specialize in water cooled vw’s. We are a full service facility and remove the parts for you and offer installation on our parts. We are BAR certified repair shop and certified technicians. Our knowledgeable staff will help you find what you looking for, so please give us a call we hope to earn your business. To extend the life of your tires, they should be rotated every 6,000—8,000 miles. If you have any unusual tire wear, performance, or ride quality, please take your car to a professional mechanic or retailer. A vibration when driving could be an indication there is a problem with the balancing of your tires. Especially if you feel a vibration that is dependent on vehicle speed and first becomes apparent between 40 and 45 mph. HOW OFTEN SHOULD ALIGNMENT BE CHECKED ? You drive through pot holes, travel down gravely stretches of road, or worse, knock your wheels on the curb while making a turn. All these things can impact the way your tires sit, throwing off alignment in an instant. Industry experts recommend an Alignment Check with every other oil change. A lot happens over the course of 6,000 miles. If it’s been awhile since your last alignment, it’s time for a checkup. In this tough economic climate it is always tempting to ignore that strange noise that you car is making. Does it need some expensive car parts that is either hard to find or expensive? This is not always the case and while buying parts can be expensive there are instances in which you can use a used part or recycled part. Before buying used parts for your car here are a few simple tips to follow: 1. Know the car part you need: There is nothing worse then ordering in a car part and it doesn't fit. Take the car part with you or use our app to send as a image of the part you are looking for. 2.Don't be afraid to look like a novice: We buy and sell used parts, we deal with beginners everyday. Don't be afraid to ask questions about the car part you are ordering. 3. Be aware, however, that when buying second hand the part is not always be returnable. The next question you should be asking yourself when it comes to car parts is which car parts are OK to be reused and which should be bought new. Here is a simple guide for you to follow: WHAT ARE OK TO USE IF IN GOOD CONDITION These items must be checked for normal wear and tear before reusing. If you are in doubt have it checked by a professional: air box, body panels, body parts, bumpers, carburetors (to rebuild), cigarette lighter, coolant reservoir, cooling fan, belt driven, door lock actuators, exhaust heat shield, exhaust manifold, exhaust pipes, fuel tank gas cap, grill, hub caps, intake manifold, interior trim, jack, lug nuts, oil pan, power window motor, pulleys, rear view mirrors, seats, steering wheel, stereo system, sunroof motor, tail lights, throttle body, tie rods, turn signal lenses, vacuum lines, vacuum reservoir, valve cover, wheels, window glass, windows, windshield washer pump, wiper arm. WHAT CAN BE RECONDITIONED AND USUALLY REUSED Another option for replacing car parts is to buy reconditioned parts. Here is a list of a few parts that are usually OK once reconditioned: a/c compressor, a/c condenser, ABS CPU, ABS sensors, alternator, axle shafts, brake drums, camshaft, clutch master cylinder, coil packs, cooling fan, electric, CPU, CV joints, cylinder heads, dashboard gauges, distributor, engine block, engine mounts, flywheel, fuel injection unit, fuel injector, fuel pump, intercooler, master cylinder, oil cooler, oil lines, oil pump, pistons, power locks, power steering pump, power window switch, pressure plate, radiator, spare tyre rim, steering rack, sunroof cables, suspension springs, timing chain, transmission, turbocharger SHOULD NEVER BE REUSED ONLY NEW Air filter, ball joints, bearings, brake discs/rotors, brake pads, brake shoes, clutch disc, cylinder sleeves, distributor cap, engine bearings, fuel lines, gaskets, head studs, ignition points, oil filter, piston rings, radiator hoses, rotor, shifter bushings, shock absorbers(UNLESS VERY LOW MILES), spark plug wires, spark plugs, strut bearings, strut inserts, thermostat, timing belt, timing chain, valves, voltage regulator, water pump, wheel bearings, wheel cylinders. The average suggestion is every three (conventional oil) to five thousand miles(synthetic oil). Factors can alter that estimate. For one, synthetic oil has a longer lifespan than conventional oil (it's chemically engineered to not gum up as quickly, especially in extreme temperatures) allowing more time between oil changes. Also, if you spend a lot of time in heavy stop-and-go city traffic, you are causing more of a strain on your engine and may need an oil change sooner.